boards at South Beach in Miami and after 2 hours we were both hooked. My first real board was a Rick 9’ 6 longboard which cost $145. I knew I was BOSS riding my Rick Custom Surfboard during the winter of 1965. One of my best boards was shaped by a guy called ‘Murph the Surf’ who was well known in Miami as a great surfer but was having some well publicized problems with the law. 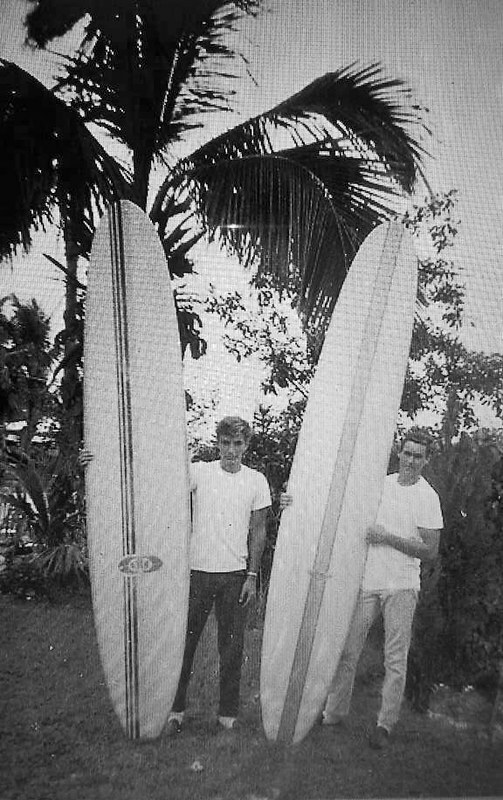 All of a sudden the Australians were showing the rest of the world that size DID matter with their new short boards which, at that time, were 8’3 with a deep V bottom in the tail. We all followed suit using these more manoeuvrable boards to go places on a wave which we had never dreamed of before. Personally my shortest board was a 6’ fun shape. I shifted to riding ‘WaveSkis’ when I was in my 30’s due to a chronic back problem. This is an Australian / South African sport where you use a kayak paddle & sit up on the ski. You drop in, cut back & work the wave as in surfing but you are strapped into this ski with a seat belt & foot straps. I was in the best shape of my life while I was on that waveski. From there I began windsurfing & collected lots of gear for all the different conditions; 3 boards, 9 sails, 2 masts, 2 booms & on & on. I really enjoyed the sport but after a while the simplicity of a surfboard & a bar of wax began to look pretty good. I returned from Hawaii a couple of years ago because although the surf, weather & sights were really great, most of the well known spots are very crowded. I’m back in Indialantic where you can always find an area with few surfers. I’ll see ya at the boardwalk, Paradise, Pelican, Seagull, 3rd Avenue (Mel Beach), 13th or 16th (Cocoa), O Club or at 2nd Light. Well I’ve finally hung up my surfboards. After removing any number of skin cancers... the last five have been melanoma. No problem since we caught them early but it just doesn’t seem smart to bake myself any longer. Surfing and watersports in general have been my joy to have participated in for many decades. As is the case with life, this is simply a new chapter. after 2 hours we were both hooked.